Valerie obtained an honours degree in French and History from University College Cork before coming to NUI Galway to complete postgraduate diploma in Arts Administration. After working in the arts and creative sector for 5 years, she returned to NUI Galway and graduated with a 1st Class Honours Master of Business Studies in 2005. 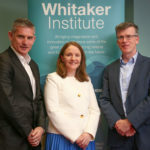 She then worked in the Whitaker Institute for Innovation and Societal Change (formally the Centre for Innovation and Structural Change) as a Research Assistant, Administrative Assistant, Acting Development Officer, and from 2012-2014 was the Dissemination and Engagement Officer for the Institute. In May 2014, Valerie joined the Health Behaviour Change Research Group in the School of Psychology as the Strategic Development and Project Manager as part of Dr Molly Byrnes HRB leaders Award.